This product is available at eBay, Amazon.com, Xcoser, Ezcosplay. 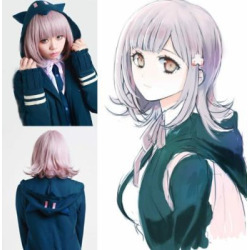 At ebay.com you can purchase Super Dangan Ronpa Chiaki Nanami Cosplay Costume Dress Uniform Suit Hoodies Coat for only $10.25, which is 93% less than the cost in Ezcosplay ($147.99). The lowest price of Dangan Ronpa Chiaki Nanami Cosplay Costume was obtained on April 22, 2019 6:54 pm.